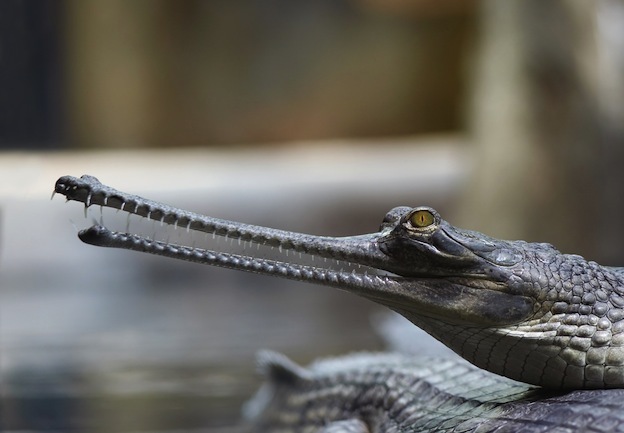 One of the distinguishing characteristics of the Gharial is that it has a long and thin snout. They have very tiny teeth with more than 100 of them in that limited amount of space. They can become very large animals with males about 20 ft, but the average size is 15 ft. The average life span for these animals is from 40 to 60 years. They feature scaly skin that is often used to make leather goods. They also have very large eyes which seem out of place for the rest of their face. They skin is a light gray to dark gray color. They often have patterns on them that help to offer plenty of camouflage. The Northern part of India is where you will find most of the Gharial. There are some in Bangladesh but they are close to being wiped out in that area. The good news is that in the area of Nepal they are increasing. They seem to prefer the activity of the deeper and faster moving waters than other reptiles. While they are able to move around on land, they are very seldom seen doing so. The Gharial spends as much time as possible in the water where they are able to move easier. Due to the design of their body they are very slow and awkward on land. When they need to soak up some sunlight to increase body temperature they will go to land. They are known to be very intelligent animals. They have a great memory which helps them to do very well in the wild. They also seem to do very well in captivity. They are isolated and animals as well. They don’t spend much time with their young which is different from crocodiles and alligators. There are plenty of different types of food that the Gharial consumes. This includes insects and frogs. Fish make up the largest part of their diet though. They will even consume dead organisms in the water including carcasses if they are hungry enough. They are excellent using their tail to hold prey in place until they can sink their teeth into it. They aren’t going to attack humans or large mammals. Their jaws and teeth aren’t designed for this to occur. They have been known to consume human accessories. This is where the stories of them being man eaters come from. They will also consume jewelry and other items in the water. The Gharial will be able to mate from December through January. They don’t lay their eggs though until the dry season. This extends from March through May and as the water recedes they are able to deposit their eggs in a nest that they have built there. The females will lie from 30 to 60 eggs at a time. It will take 90 days from that time for the young to begin to emerge. They are on their own to get from the nest to the water. Once they do so they will remain under the care of their mother for a couple of days. Then they are on to take care of their own needs. As a result, many of them end up being killed by various predators. 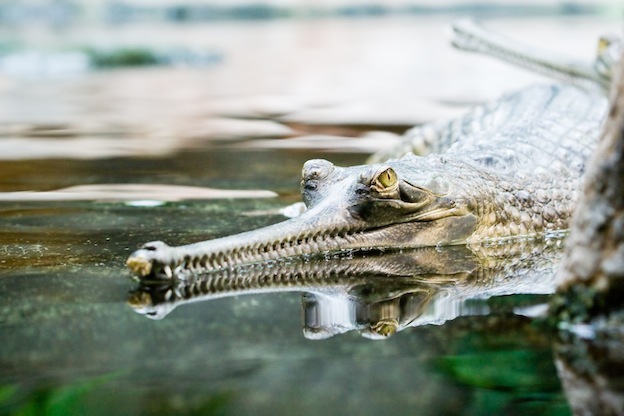 The future for the Gharial is very uncertain as it is classified as critically endangered. There are many efforts in place to help increase their numbers in captivity. Two of these locations include the Honolulu Zoo and the National Chambal Sanctuary.